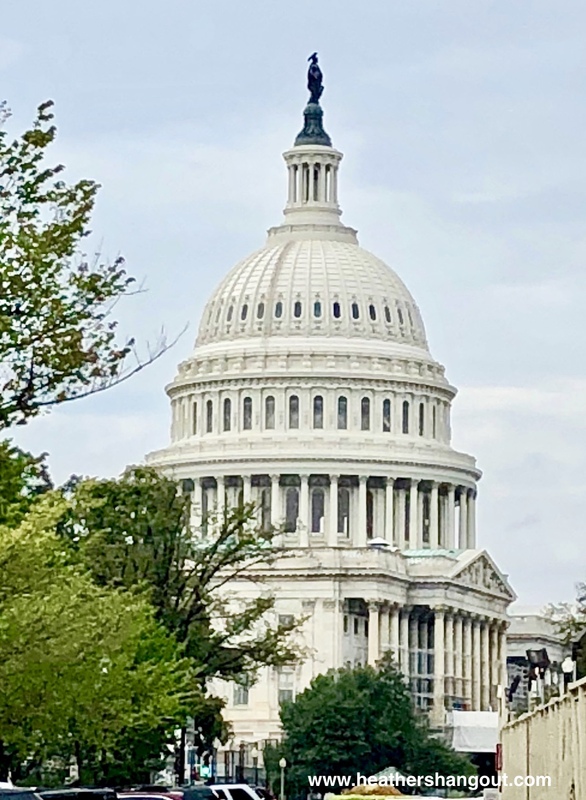 It was another inspiring, motivating trip to Washington, DC to advocate for improved cancer care and prevention programs. Last week I journeyed to our nation’s capitol with almost 500 cancer advocates from the American Cancer Society Cancer Action Network. We were there for advocacy training and to meet with our Senators and Representatives to improve research, care and prevention programs. Being in DC, with so many other cancer advocates, is so empowering and exciting for me, both as a cancer survivor and daughter who lost her father to the disease. It’s an opportunity to use my voice to share my family’s story, and the stories of hundreds of others touched by cancer. To share the impact research made on both my dad’s and my journeys (read how research saved my life and leg), to point out the benefits of affordable access to care, preventive screenings and new treatment options on people’s lives. I love being surrounded by other passionate people fighting the same cause. We represented all 50 states, Puerto Rico, Guam and the District of Columbia in more than 500 meetings with our legislators. Amazing! $2 billion increase for the National Institutes of Health to fund medical/cancer research. When we arrived the Senate had already passed their version of the budget so we thanked them during our meetings and asked our representatives for support. I’m THRILLED to report that the House also voted to approve this budget, and the President signed it last Friday. Remove barriers to colorectal cancer screening. Colorectal cancer is one of the few cancers that can be prevented through screening. This year, more than 140,000 Americans will be diagnosed with colorectal cancer, with half of those being Medicare patients. Most private insurance companies do not charge a cost-sharing (co-insurance) to customers. There is a loophole in Medicare regulations that require these patients to pay a 20 percent coinsurance (not deductible) if a polyp is removed during a colonoscopy. Many Medicare patients go into this vital cancer screening test thinking there is no cost, only to get a charge if a polyp is discovered and removed. I frankly think this is ridiculous, especially affecting a population that is most often on a fixed income. And removing a polyp is the very act that can prevent cancer, therefore keeping healthcare costs low. We asked our representatives to support moving this bill out of committee to a vote. You can take action on this bill. Support the Palliative Care and Hospice Education Training Act. This bill would help improve quality of care and quality of life for ill patients by providing coordinated, comprehensive care. It also supports education and training of professionals. The House unanimously passed this bill so we’re waiting on the Senate to move it forward. Our two Michigan Senators are co-sponsors of this bill, and we’re hoping to get this to a vote soon. You can take action on this bill. One of the highlights of this trip is attending the ACS CAN Lights of Hope ceremony. I shared highlights of this event in a previous blog. This year’s amazed me as much as last year’s event. More than 33,000 luminaries lined the Lincoln Memorial reflecting pool (26,000 were there last year). 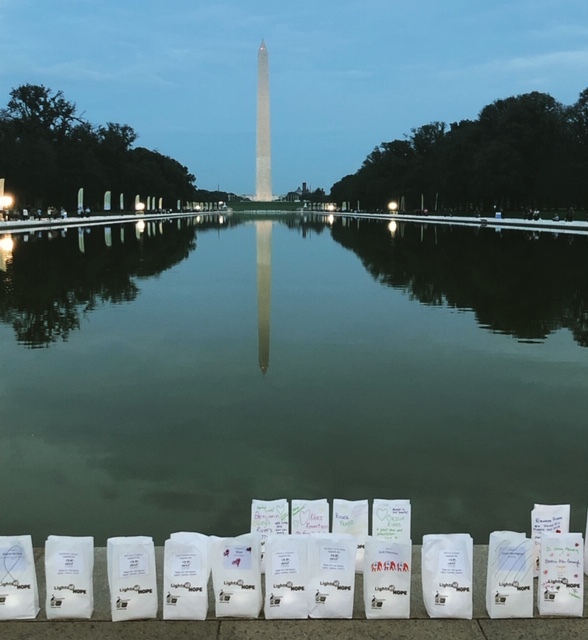 Consider that these bags represent cancer survivors and those who died from the disease. The president of Celgene, a pharmaceutical company that sponsored the event, spoke of new clinical trials and drugs showing positive improvements in difficult cancers. Most notably to me was the advancements of drug trials for patients with multiple myeloma, the cancer that took my dad from us. I admit his update on the new treatment options moved me to tears, thinking of my dad, whose story motivates and pushes me to advocate for treatment improvements like this! Lights of Hope brighten the night. Channeling my inner Super Girl to be the best advocate. Thank YOU for your continued support, for reading these stories, sharing your stories with me and encouraging me in my efforts. I am grateful. You can join me in the fight against cancer – join the American Cancer Society Cancer Action Network in your state! What an event! Thank you for all you do, Heather! Thank YOU for your efforts too, Ray! It was an inspiring time.